Democratic and political issue bumper stickers to show your support for the Democratic party. Tell the House GOP to stop ignoring immigration reform! Show your support for immigration reform with this 4" x 4" union/USA made bumper sticker. Contact us for bulk pricing. Turn the GOP's slogan against them with this bumper sticker. Each bumper sticker measures 4" x 4" and is union made in the USA. Contact us for bulk pricing. Be proud you're a democrat! (It's the GOP who should be ashamed!) This bumper sticker measures 11.5" x 3" and is union made in the USA. Contact us for bulk pricing. Are you tired of Donald Trump? Call him out with this anti-Trump bumper sticker! This bumper sticker measures 7.5" x 3.75" and is union made in the USA. Show your support for marriage equality with this 4.5" square bumper sticker. Union made in the USA. Contact us for bulk pricing. These words of wisdom from Michelle Obama at the 2012 Democratic National Convention obviously fall deaf on Republican ears! This bumper sticker measures 11.5" x 3" and is union made in the USA. Contact us for bulk pricing. This bumper sticker is a great way to show how you feel about your country and those who don't appreciate it. This union-made bumper sticker measures 11 1/2" x 3" and is union made in the USA. Contact us for bulk pricing. The deficit isn't a crisis. High unemployment is! Tell the GOP to get their priorities straight with this bumper sticker. This bumper sticker measures 7.5" x 3.75" and is union made in the USA. Contact us for bulk pricing. Like weekends? Thank the Unions. It wasn't the "free market" that gave you those days off. This union-made bumper sticker measures 11 1/2" x 3" and is union made in the USA. Contact us for bulk pricing. Tell republicans that you want them to overturn Citizens United. Show where you stand with this 6" x 3" bumper sticker union made in the USA. Contact us for bulk pricing. Be proud of your democratic child! It is the Republicans that should be ashamed. This bumper sticker measures 9" x 2.5" and is union made in the USA. Contact us for bulk pricing. Be proud of your liberal child! It is the Republicans that should be ashamed. This bumper sticker measures 9" x 3" and is union made in the USA. Contact us for bulk pricing. Be proud of your progressive child! It is the Republicans that should be ashamed. This bumper sticker measures 9" x 3" and is union made in the USA. Contact us for bulk pricing. Be proud you're a democrat! (It's the GOP who should be ashamed!) This bumper sticker measures 3" x 9" and is union made in the USA. Contact us for bulk pricing. Share the word that everybody should vote Democrat! Show your pride with this union and USA made 11.5" x 3" bumper sticker. Contact us for bulk pricing. Do you want to annoy the Republic-ans? This bumper sticker measures 9" x 3" and is union made in the USA. Contact us for bulk pricing. Fact: Social Security is a self-financed program. It does not add to the deficit. It currently has a surplus of well over 2 trillion dollars. Tell the GOP to get their facts straight! This bumper sticker measures 7.5" x 3.75" and is union made in the USA. Contact us for bulk pricing. Let's stop this cruelty of breaking up families with our current immigration laws. Stop Deportation now! Show your support for immigration reform with this 4" x 4" union/USA made bumper sticker. Contact us for bulk pricing. Send the message loud and clear - "Tax the rich!" This bumper sticker measures 4" x 4" and is union made in the USA. Contact us for bulk pricing. Be proud you're a democrat! (It's the GOP who should be ashamed!) 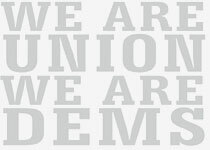 This democratic bumper sticker measures 11.5" x 3" and is union made in the USA. Contact us for bulk pricing. Let's face it. 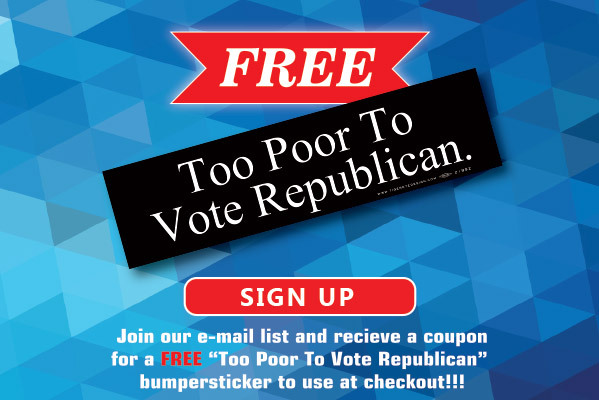 If you're not rich, there's really no reason to vote Republican! This bumper sticker measures 11.5" x 3" and is union made in the USA. Contact us for bulk pricing. Let's face it. The truth is the truth, nobody can create their own facts! This bumper sticker measures 11.5" x 3" and is union made in the USA. Contact us for bulk pricing.